US Army and Navy Landing Craft Utility (LCU) type 1600 are huge bulletproof landing craft that can carry up to three heavy tanks. The stabilized gun on the M-1 Abrams tank allows LCUs to become deadly gunboats. Tanks have always been able to fire from LCUs but the pitch and roll at sea made fire inaccurate. Even in perfectly calm water, the recoil caused by firing a tank gun makes an LCU rock for a few minutes. However, the M1 tank has a stabilized gun that allows it to fire on the move, on the ground or at sea. These tanks need not run their engines for power since newer A2 versions have small diesel generators, or the LCUs could have power cables. Although an LCU can carry three heavy tanks this is discouraged for safety reasons. Since the M-1 tank carries only forty 120mm rounds, space is needed to embark extra ammo. Therefore, an LCU gunboat should carry two M-1 tanks and several ammo crates to provide powerful fire support. They can be launched from amphibious ships a hundred miles offshore and approach a hostile shore to blast targets ashore. An LCU has a low profile, so it is difficult to see and hit. 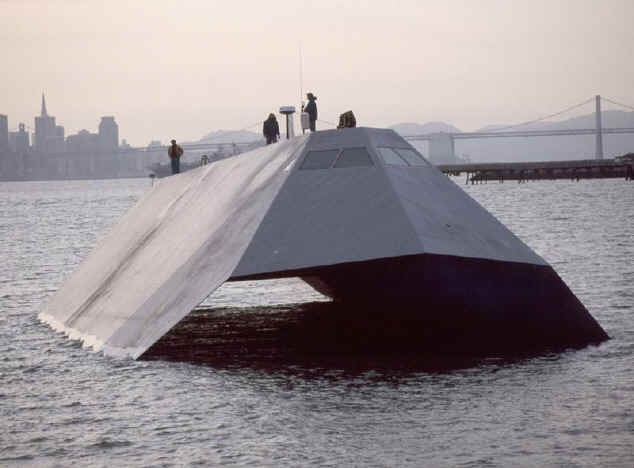 Angled radar-deflecting planks can be mounted on the sides using technology developed from the Navy's "Sea Shadow" program (below) to make them invisible at night. If an amphibious force launches six LCUs at night to sneak up on an enemy position near the shoreline, twelve 120mm guns can open fire directly at shore targets. Anyone attempting to return fire or approach in small boats would face instant destruction, especially since each tank has three machine guns as well. These LCU gunboats are necessary to provide cover fire for amphibious assault vehicles heading ashore since the battleships have been retired and the Navy is reluctant to risk new expensive unarmored destroyers to shore fire. An LCU may embark artillerymen to calculate indirect tank fires at targets up to 10 miles inland. LCU gunboats may venture into bays and up rivers to attack inland targets or support operations ashore. 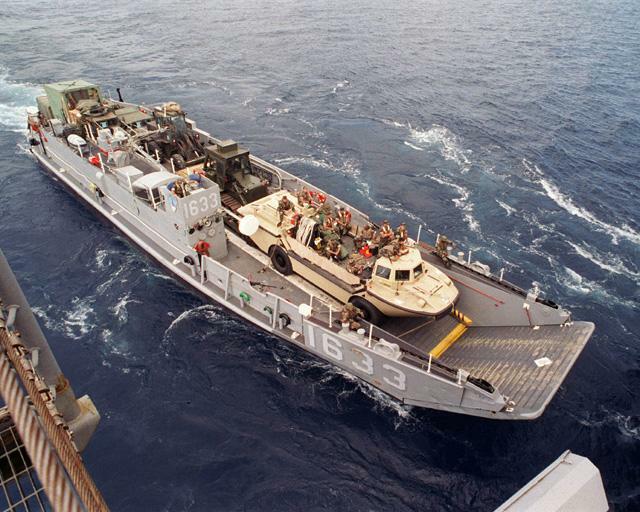 These gunboats can become key weapons in supporting low-intensity operations in difficult terrain, such as the Delta region during the Vietnam conflict. The perfect training area for this exists at the San Clemente naval gunfire range, just off the coast of Marine Corps base Camp Pendleton. Marine Corps tanks can board LCUs and cross 50 miles of water to fire at San Clemente from offshore. This idea was formally proposed to the Marine Corps in 1996. A Colonel assigned to review the concept thought it was a good idea, but identified two problems. Although the M-1 tank can fire forward from an LCU, the higher sides do not allow the gun to fire downward. In addition, he was concerned that the gun blast could break the LCU's windows. As a result, he dismissed the idea, even though these two problems are easy to correct. Railroad ties or Medium Girder Bridge planks can be used to line the deck of the LCU to allow tanks to ride a foot higher on the LCU to solve the turret movement problem. Another option is a simple modification to one side of the LCU, allowing it to fold down one foot. If the windows break from gun blasts, replace them with heavier glass; they should be bulletproof anyway. Another weapon system needed for LCU gunboats is the new Centurion C-RAM anti-missile system. 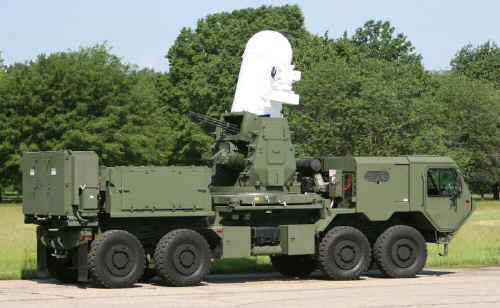 (pictured) This is a mobile ground-based version of the proven Navy ship-based CWIS system that fires a radar-guided 20mm gatling gun. These have proven successful at shooting down small rockets and mortars in Iraq. It also has an optical/IR site for manual firing at any target. As LCU/Tanks and AAVs approach shore, a modern enemy may launch anti-ship missiles, anti-tank missiles, guided mortars, armed drones, and attack helicopters. Several LCUs with C-RAMs embarked should be able to shoot down most threats and rake shore targets with fire if needed. C-RAMs may also be carried topside on ships to augment missile defense, especially aboard cargo ships that have no defensive systems. The Army and Marine Corps have complained about the loss of fire support since the battleships were retired. An LCU/tank gunboat is not the complete answer, but can provide effective amphibious fire support today at zero cost. C-RAMS provide a new defensive shield that is desperately needed and would not only protect the landing force, but gun down shore-based missiles fired at ships far offshore.